Self-Stirring Coffee Mug: Necessary or Ridiculous? VIDEO: How can a mug stir itself without batteries or a stirring straw? Watch this innovative design at work. One of the small but significant challenges that comes with enjoying a hot drink is making sure it’s properly mixed. There’s little worse than a pool of honey stuck at the bottom of your teacup, floating bits of hot chocolate mix atop your warm milk or improperly dissolved sugar in your coffee. 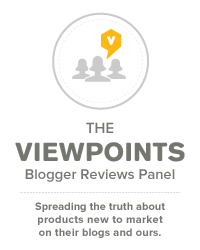 The problem intensifies in popular coffee shops like Starbucks. We all know those skinny popsicle sticks do nothing more than swirl everything around. It turns out there’s a solution to this pesky problem, at least for the gadget-minded. Self-stirring coffee mugs do exactly what you expect. 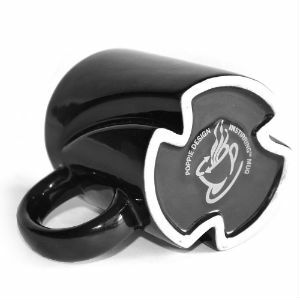 A small, battery-operated propeller at the base of the mug whirs at high speed, creating a vortex of liquid and effectively stirring everything inside. I can think of a few great opportunities to use this type of device. At coffee shops, like the aforementioned location, that lack spoons. In the office, where plastic stirring straws reign supreme. Those should be relegated to weddings, where small children can treat them as fun-sized drinking straws. On the go — dump hot coffee, cream and sugar into your travel self-stirring mug and run for it. No need to waste a spoon when you’re short on time. Do you think a self-stirring mug may be the thing for you? I’ve looked into some of the best options out there, and have assembled a handy list for you below. 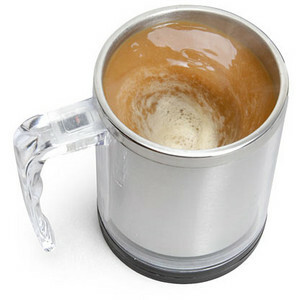 This 14-ounce mug comes with a travel lid, runs on AAA batteries and costs $18.99. A plastic disc at the base swirls drinks like a pro. To clean, simply pour in soap and turn on — the disc whips the soap into a froth that can then be rinsed out. If you’re looking to call someone out on their laziness, this novelty mug should do the trick. Like the ThinkGeek mug, this one requires two AAA batteries and starts with the push of a button. Stainless steel construction keeps your drink warm, but at $22 you might as well get the ThinkGeek mug. Whether you’re low- or high-tech, it seems like there’s a self-stirring mug out there for everyone. Just remember, the battery operated ones shouldn’t go in the dishwasher, due to the risk of rusting. Plus, the InStirring mug is eco-friendly too. Which would you choose? how lazy can people get??? ?